Remember all those gorgeous veggies I photographed the other day? 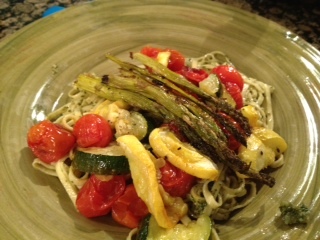 [see Aug 1] Well, I have a big basil plant taking over one of my patio pots and I have Ina Garten’s Amazing Pesto on my “Bucket List” of recipes to try, so I decided to make a pesto dressed pasta topped with roasted fresh veggies. It was YUMMY! 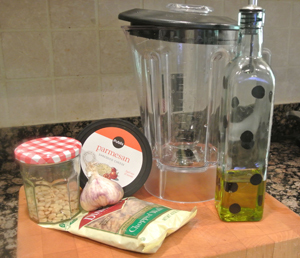 Pesto is SO EASY to make, I can’t believe I’ve never made it before now. 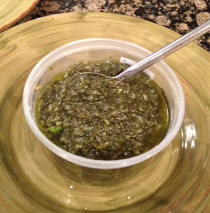 It tastes so much lighter and fresher than any store bought pesto I have had. I can’t wait to mix it in a little mayonnaise for a sandwich or dip. 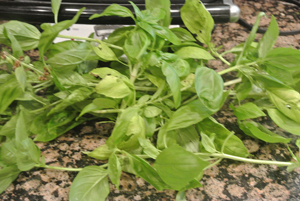 Here is the fresh basil straight from my patio. Just ignore the leaves with holes, nature isn’t perfect you know! Actually I have more of a black thumb than green, it’s a miracle anything grows in my backyard! Only the hardiest plants survive! I can usually manage basil & parsley. 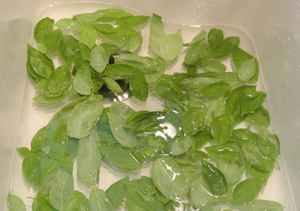 Strip the leaves from stems and toss in a sink full of cool water to thoroughly wash. Drain on paper towels, then wrap in paper towels and put in a large ziplock bag and refrigerate until you’re ready to make the pesto. 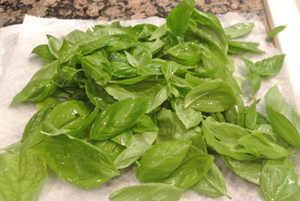 The basil will stay fresh this way for at least 24 hours, but then the leaves might start to blacken, so its best to use promptly after picking. 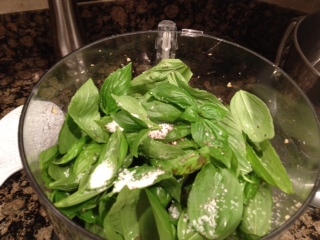 gather your ingredients, [forget the blender, I’m going to use a food processor] and pulse the nuts for 15 seconds before topping with basil. Use your imagination to picture the chopped nuts that I forgot to photograph. Add the garlic, salt & pepper and turn on processor, pouring oil into basil in a steady stream until it looks like the right consistency. Add a little more or less oil depending on how it’s turning out. Now its time to get the veggies going. 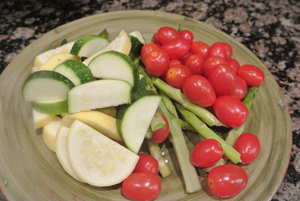 I am using grape tomatoes, asparagus, yellow squash & zucchini. I can’t tell you how much I LOVE roasted vegetables, they are so flavorful, so easy to prepare and so healthy. Just throw them on a foil lined pan sprayed with cooking spray, drizzle with Olive Oil and little salt & pepper and pop them into a 400 oven for 20-30 minutes. 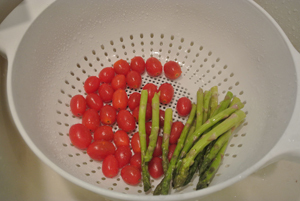 While the veggies are roasting, get water boiling for the pasta. Time it so the pasta will be done at the same time the veggies are finished. 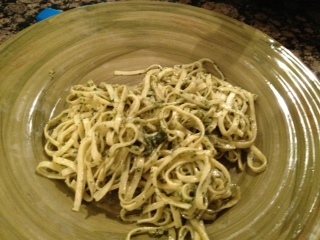 I used fresh pasta from the deli section at the grocery, Buitoni linguine, which only takes about 3 minutes. Dried pasta takes a bit longer. Vegetables are done! You can top them with some more Parmesan now, but unfortunately I ran out…I also don’t have every step pictured now because I DROPPED my camera and have to use my iphone. I am pretty depressed. I also forgot to turn the water off when I was filling the laundry sink today and it overflowed all over the laundry room floor. It was soapy water so after I mopped it up with towels and put them in the washing machine, my washer kept stopping and buzzing saying soap overload. I also flooded the basement [just a little]. I have had an interesting day. I am looking forward to this comforting dinner with a nice cold bottle of wine, I mean glass. Toss the hot drained pasta with pesto to taste. Put the drained pasta back in the hot sauce pan, add the pesto and return it to the eye on the cook top which is still warm but turned off. 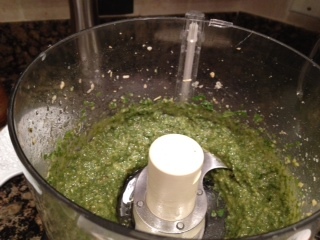 This helps melt the pesto and it keep things hot in the process. Now top the pasta with veggies and enjoy. I would definitely add some cheese now. I can’t believe I don’t have any, I NEVER run out of Parmesan…well, almost never… Good news though, Hungry Husband FIXED my camera! I can’t believe it! I am so excited. I swear that man can fix anything! I should call him Handy Husband. My pictures will be better next time, I promise. 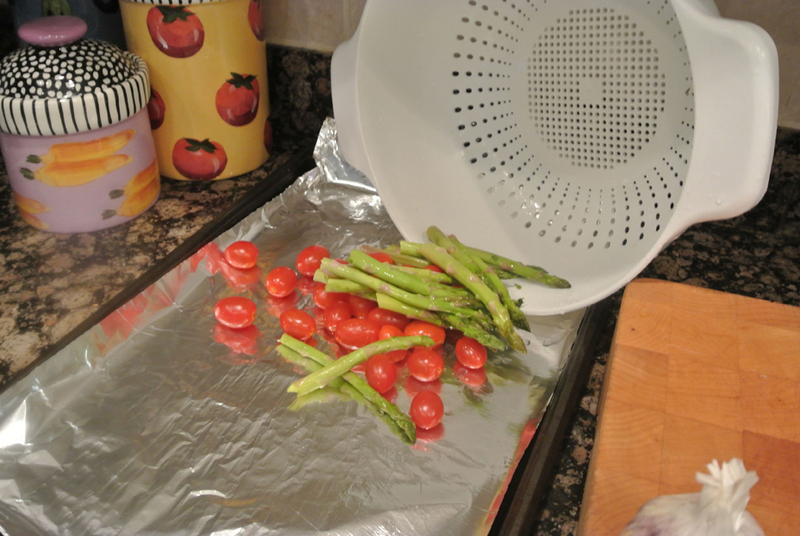 Spray a foil lined pan with cooking spray. 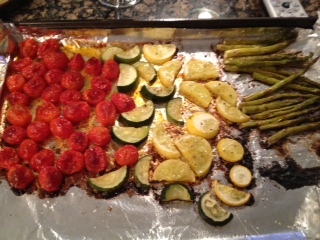 Arrange vegetables in an even layer and drizzle with Olive Oil and season. Bake in a 400 degree oven for 20-30 minutes, until vegetables are starting to brown and look done. 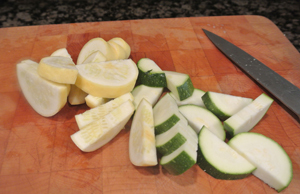 It is hard to pin point cooking time here because it all depends on the size of your vegetables, just keep an eye on them after about 20 minutes.